Razing the Razorback - What we dealing with exactly? 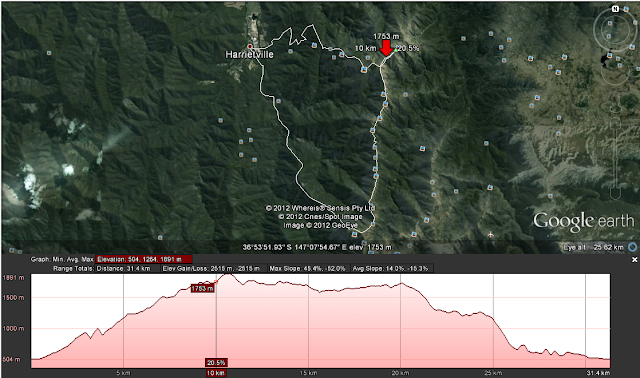 And this is just the elevation profile for 38k, that's 1300m within the first 5k 10k (updated a more accurate map!) smacked right into your face! That's like reverse TMBT, only higher! To think that I actually studied the 64k route & contemplated doing it.. please. don't make yourself laugh boy. You ain't ready & you had better respect the distance! or in this case, the ELEVATION! 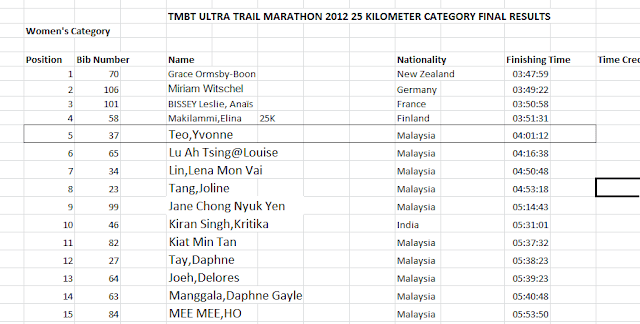 Then again, you could do the 64k with crap timing & still call yourself an ultra-runner... hmmm. But seriously, you don't want to be the dude who DNF or did not make the cut-off - that'd be kinda.. well.. embarassing! it's true & you know it! 64k on a terrain like this is as good as any flat >100k ultra. So dear boy, do me a favour & focus on securing a decent form & decent time & decent result for the 38k, run it strong, run it good. And if you're gonna get competitive & all, you're only allowed to stop to take pics ONLY when the views take your breadth away.. which I suspect will be quite often.. hmm. So no, don't think that's gonna work. Back to just running strong & good then, & fast (for someone ur level)! 1300m in 10km. Good luck buddy. Them legs are gonna hate you! Been wanting to document this trail since I started running it early August in the winter cold, now with my tough cam I'm able to take better pictures & do the trail some justice, looks like the camera is gonna be my new running buddy! and spring is here meaning nicer temperatures & longer evenings! 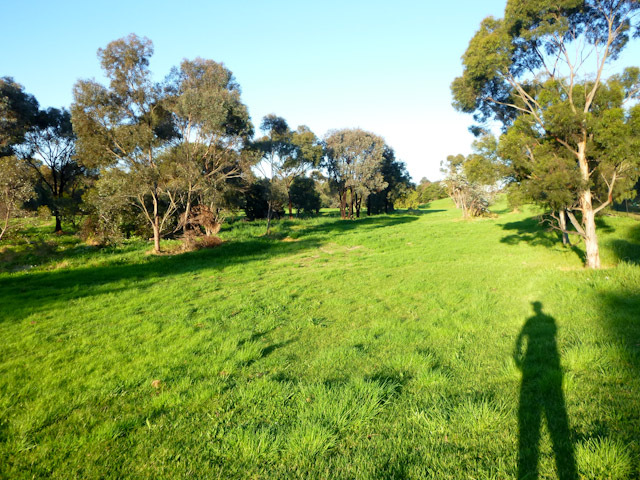 So anyway - Koonung Creek Trail stretches along the Eastern Freeway & Eastlink in Melbourne, and sits snugly between neighbourhoods and the freeway itself. 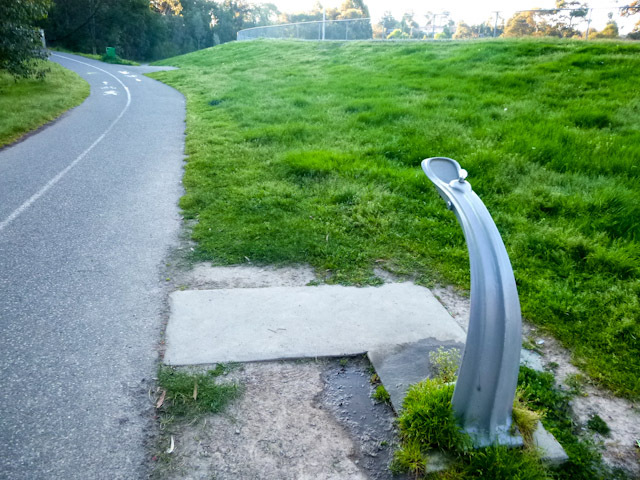 It's part of the wide network of bicycle trails that blankets Melbourne so we get a lot of cyclists zooming up & down this part of the trail either to get to/from work or just for exercise. There are some parts of the trail I enjoy running along, thought I give them special mention here! This lovely green patch is Eram Park - and while it isn't anything out of this world it's still a beautiful patch. Love running this simple loop around it. 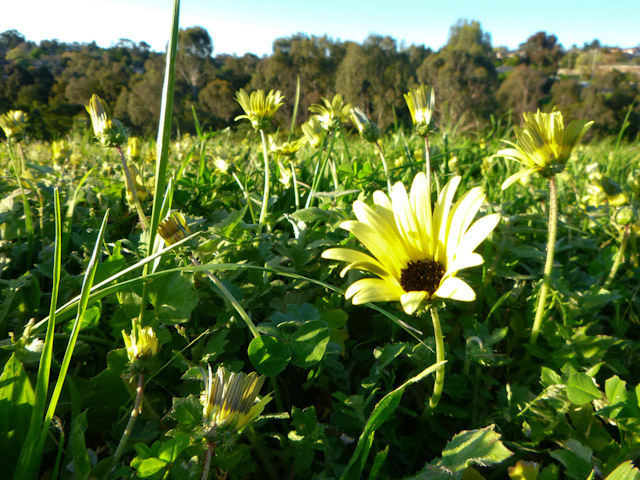 Extra inspiration can be drawn from the lovely spring flowers provided you don't trample on them! Heh.. check out this little curious graffiti here, wonder whether it's lamenting bout the dried grass stuck all over its body? 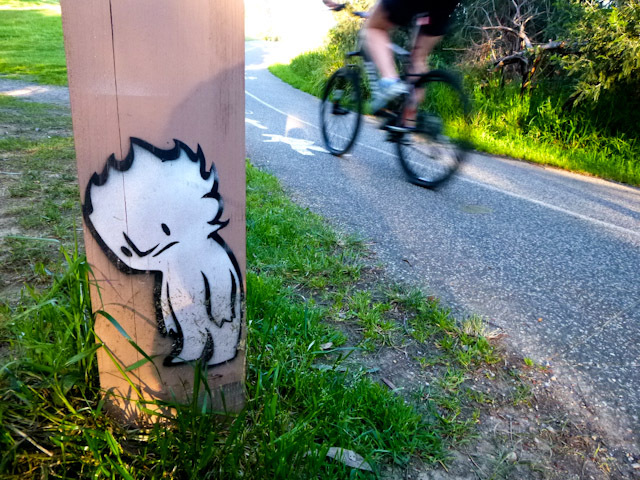 You can find this guy on the eastern edge of Eram Park! 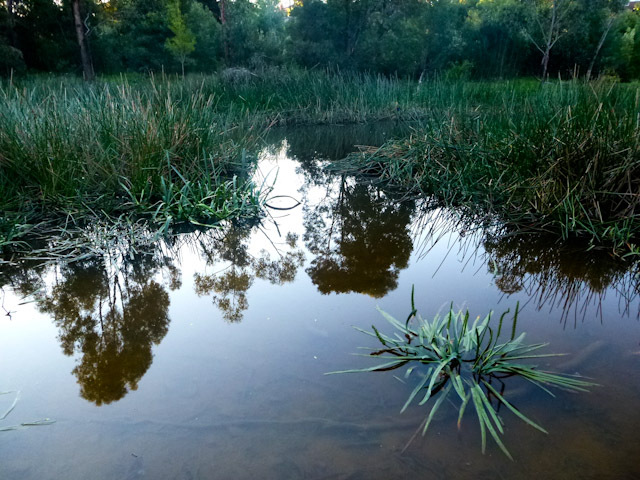 Leaving Eram Park and entering Boronia Grove Reserve, you will pass this stagnant pond on your left. The calm reflections on the pond often catches my eye & I'd stop for a breather..
And coming into Boronia Grove Reserve, we get this water tap & while I've hesitated in the past drinking from it - I've grown to look forward drinking from it these days! And it serves as my water station & a conveninent marker for me to plan my longer runs. Nice. 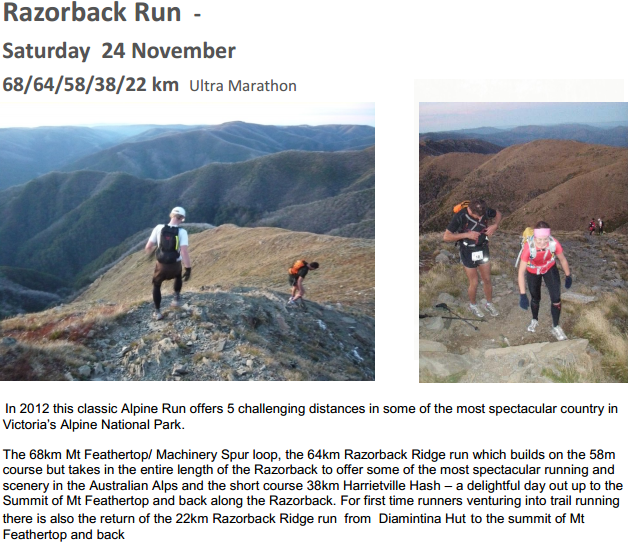 Like a broken hearted teenager, I needed some kind of rebound after all the emotions at TMBT 2012.. it didn't take me long to dig through the local runs on the internet & set my eyes on the Razorback Run taking place in the Alpines National Park!! The views are STUNNING.. here's a cutout from their flyer!! 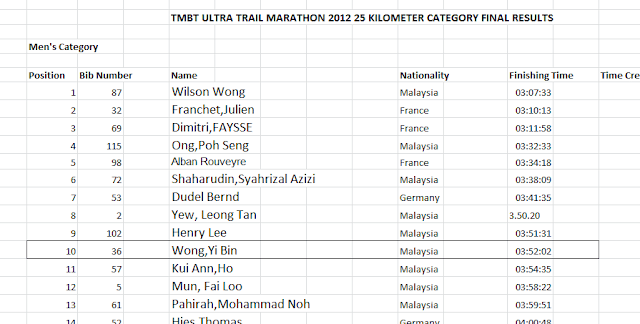 Wrote to them 2 days ago said I did all these wonderful things in TMBT can I PLEASE be accepted to the Razorback coz they had min requirements of 30k trail experience in past 6 months for runners. Organizer Paul said YES :) must've been the pictures on the TMBT website that got his attention. And it's always nice to get a YES! Eyeing the 38k coz it will serve as a nice progressive build up for me plus it contains the difficult technical bits + the beautiful ridge run which I want. SLIGHTLY overshadowed by wife making top 5.. but you can read all about that in her blog I'M SURE. hehe.. so just wanted to share the elation, tho like the wife remarked, it's really just syiok sendiri since we didn't have any target time or position. Still a nice feeling to have come through a competitive event with a decent position. Staring at results, makes u wonder what if I had pushed a bit harder in the beginning, or did my pacing differently etc... results do that to you, don't they? heh.. that's what keeps us fighting I suppose. Check out wife's achievement! Top 5 oooo... very proud of her. First local girl lagi. Wonder whether sponsors will entertain if we use this to ask for sponsorship. hahaha..
Aman: We are a small organization, who’s goals are very different from event companies and corporate event companies. We do not want/need the big corporate sponsorships and we certainly want to avoid the ‘mickey mouse sponsor’s’ gala before and after the event because we want the focus to be on you and you only. This has always been our philosophy from the beginning and sometimes, big sponsor’s don’t see things the way we do, which is why we did not enjoy working with the 1-2 big outdoor brands we worked with in the past. 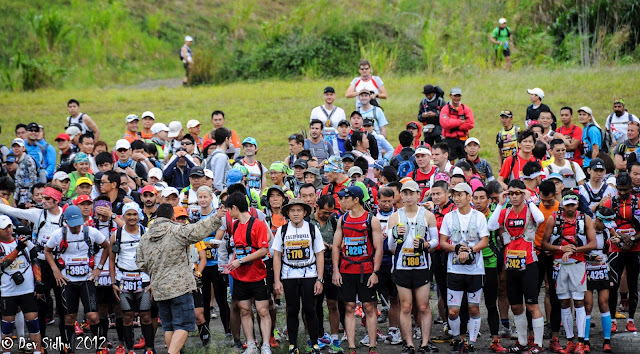 When a country manager has different ideas from us and is interested in sacrificing the aims of the Sabah Adventure Challenge for mass numbers and and severe damage and destruction of race course routes and village trails, especially through the jungle paths and plantations, it goes against how we see things and we are more than happy too walk away from a sponsorship deal. Aman: You must realize by not racing with headlamps, you are putting yourselfs at risk if you are caught on the race course after dark. You're race is over and all the money you have invested in the event would be wasted. And, let's not forget, whilst other runners are abiding to the rules, you aren't and against the spirit of competition and this should not be repeated again. Bin: That's right! Hit them hard Aman.. rules are rules are rules, they're there for a reason! Aman: Once again, runners were dumping bottles, empty energy bar/gel packets throughout the race course and it was bad. We had made it known prior to the event that rubbish could be disposed of at water stations but this was completely ignored by a small number of runners. A review of the penalty’s for this will need to be done for future races on how we can better improve preventing this from happening again. Bin: I'm speechless & this is so unforgivable the penalty for rubbish throwing should be to run the opposite direction so that every runner can see THAT FACE OF SHAME! I mean c'mon folks... we do races like TMBT coz we love nature & yet.. sighhh..
Aman: So, for some, the 2012 race course was perfect. For others, they felt it wasn't their cup of tea. I again, had stated this race course was not the originally planned race course but some people have neglected to realize this since they don't read the email updates we have been sending out every month for the last 6 months. Bin: GUILTY. But to my own defense I did try to catch up with the emails, I just ended up confusing myself... and the wife... So do we need headlamps or not?? No no no.. our starting point is at KK HQ laaaa... etc. As for the race course - there really isn't much to say, everybody signed up knowing routes were not fully known nor fixed, so TMBT don't owe nobody no perfect race course...! Besides, at the end of the day all that matters is that we showed up & took on the battle. Speaking of battle, nearly forgot to give tribute to my faithful NB 876, it performed brilliantly during the race. 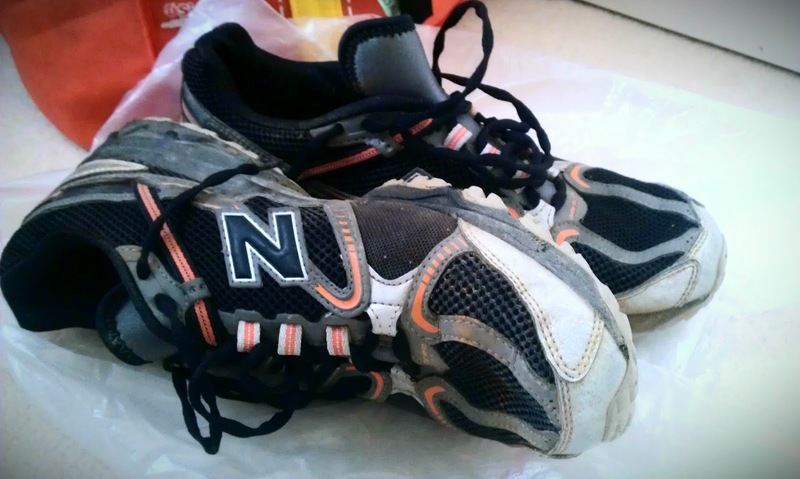 No blisters, nothing. Yanking it out from the plastic bag with dirt & dust still covered all over it brought back instant memories :) ... yes I admit I'm still thinking about TMBT! Sobs! 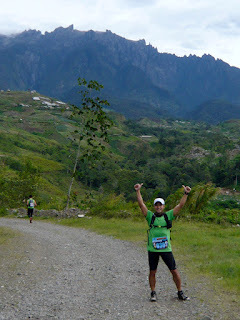 TMBT 2012 Race Report - Perished & Proud! It felt good to be there, it felt right. I knew we were gonna have a good run. Back to the the grind of reality as I try to gather my thoughts & all I can (want) to think of is TMBT!! 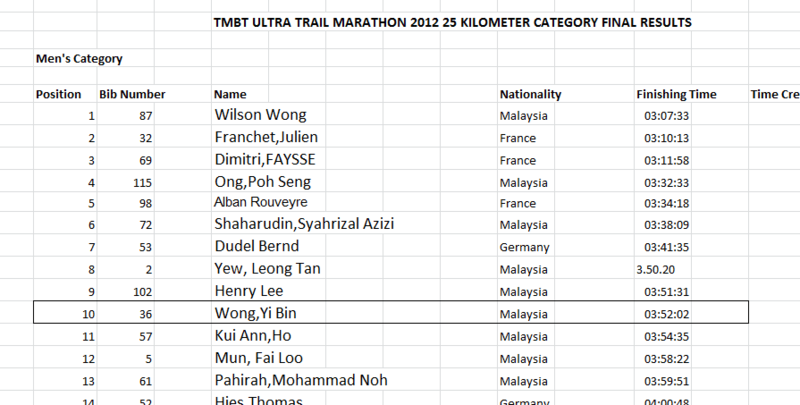 What a feeling... TMBT 2012 will now forever be in a special place in my running memoirs. The organizers did a fab job designing this route & making it happen & we did a good job signing up for it! Especially if they're not planning to repeat this route in the future! shame tho huh?? But you can imagine.. it was very frustrating. I was still feeling half-dead with headache & runny nose on the Tuesday before race day Saturday, but after sleeping like crazy & piling on the drugs, I was actually surprised I was feeling 10x better by Thursday. Super high-five to Flucor & Ho Yan Hor!!!...... Flucor is highly recommended btw. It was a relief that I could run but I knew my body had weakened considerably. So despite the super HEAVY downpour half-way through the briefing, and the fact that I was shivering after getting caught in the rain trying to retrieve our car, I would not be stopped. Not now. The winds were howling throughout the night in our little simple homestay room and after being entertained with traditional music by the homestay owners (that thankfully ended by 10pm), I just snugged up & told myself.. it's gonna happen. Come rain or shine! Stepping out at 6am, the weather was cloudy, winds were semi-howling, the rain stopped & overall it was definitely bearable weather. It was a relief... Walking from our homestay to Kundasang War Memorial, the view of Mt KK looming against the rising sun really did take my breadth away. It felt good to be there, it felt right. I knew we were gonna have a good run. "All the best all the best!"... A short clip of the flag off! First 10k. THE VIEW WAS JUST AMAZING. Mt KK like I've never seen it before.That Most Beautiful Thing was everywhere I turned. The organizers deserve a big pat on the back for this. I actually found it hard to focus on the run coz the view was just so damn inspiring! So we just stuck together, taking pics of the villagers, saying hi to the kiddies, stopping a lot, laughing & turned it into a free & easy TMBT hike instead of run! Many others did the same ~ besides with the kind of slope we were tackling there was no way of sustaining a run. Not at my level anyway! 14k. This was where the 25k split from the 50k runners. At that point we were 26 n 27 in our category & it must've been the emptiness that made us wonder where on earth are the 25 runners in front of us?? Kiasu-ness kicked in & we thought since it was gonna be largely downhill WE SHALL GIVE CHASE! We gave each other the target to make top 20! So we started running..! Some feelings we had at around 10k! 15k. We were 24 n 25 at WS3. We decided to waste no time to start our final 10k+ chase... so drank some water, snapped a puppy pic & off we went. By 17k we were catching up with some runners. I started reloading with a power gel. 20k. The wife said... Go la you! So off I went! To do my best in the final 7k with what I had. Final 7k. I mean, how tough could it be right?.. WRONG. 20-25k. Well. It was the longest n toughest downhill my poor legs have ever tasted. Gravel. Non-stop pounding on the thigh muscles and hamstrings, not to mention ankles & sole to maintain balance and controlling speed of descend. The ribena pack and 2nd power gel and the remaining water was used up very very quickly... the sun that has been largely missing all this while started emanating heat behind the veil of clouds & was getting warmer and at one point in the final 24k, I must have had my first out-of-body experience..!! Or rather my first inside-body experience!.. the body wasn't mine anymore, it was just a machine with two legs working in auto-pilot mode & I felt like I've shrunk further into my head & was just watching myself from inside. I remember telling myself you must snap out of it. But I knew I was gonna be in trouble soon. 26-28k. I was walking, I've tanked. Hit the wall & about to fall flat on my face. The 4 runners I passed earlier caught up with me. I was thinking.. U fool, its 27k not 25k, your pacing has gone all wrong! The category name of 25k must've stuck in the subconscious. But I was at a point where I was just glad the muscles were not cramping up. I was munching M&Ms down my dry throat (no more water!) and dragging my two lifeless legs, finally the final 1k was visible. The 100m elevation over that 1k was the killer genius of the plot. And I'm pretty sure placed by design by evil route designer Klauss Clause to push our bodies to the limit just before WS4 & right after our legs have turned into jelly from the never-ending pounding from the descend. I stopped at least 5 times at this final stretch, streams of lactic + blood + pins + sore just gushed down to my feet every time I stopped. With me was a fellow 25k runner in this agony and while there was nothing left in the physical body, it was the mental strength that took over & pulled me (& all of us I'm sure) through to the end. In the WS4 hall, I sat at the bottom of the stage in total exhaustion. In my blurry vision, I saw a lady speaking to a guy with mustache & was pointing at me. He then came to fan me like Cleopatra while I recovered. What an angel. And further kudos to the medical team for their quick attention to the needy. Fortunately I recovered fast and found out I ran with the top ladies of 25k. I congratulated them and it was hardly 10min after, the wife suddenly showed up! I was in disbelief. I was even contemplating SMSing her warning her about the final hill, but clearly she had already conquered it! Ha! 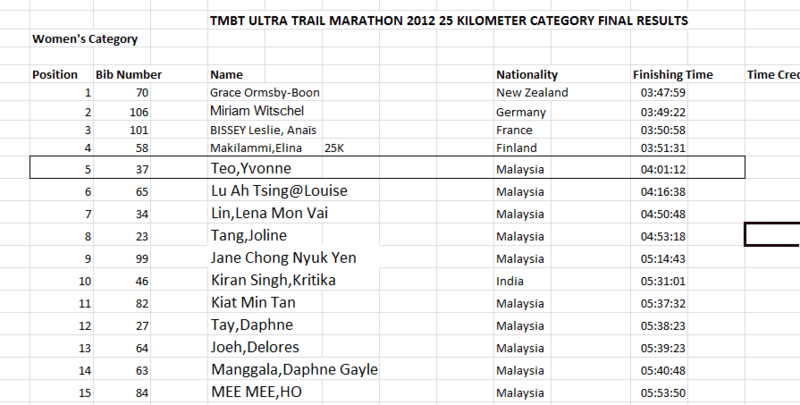 Not too sure at this stage but seems she was the first local girl for 25k category?? & 19th overall! We made our top 20 :D Can't remember much now but we went on rambling and hugged and congratulated each other. The WS4 hall was just mainly the 25k finishers quietly recovering, lying on the floor like dried-out ikan bilis but I'm very sure smiling inside with what we had all just achieved. Overall I think it goes without saying that TMBT totally must retain having Mt KK as part of the route going forward. Some fellow runners lamented the lack of jungle & river-crossing - elements from 2011 that weren't included this year & I do feel the same. People have come to expect a closer presence of mother nature as compared to having too much gravel. Having said that the route design this year was commendable, but I felt it would've suffice even with 2-3 notches down the toughness scale eh? Nonetheless it truly has been a humbling experience - the 50k and 100k runners have shown me I'm far from ready for ultras & my deepest respect goes to all who went the distance - be it physically or mentally. I do feel a tiny itch as I write up this race report, a bite from the ultra-bug?... :) We shall see what the future holds. The thighs & hamstrings are still very sore & recovering. See la how first...... haha. Meanwhile here's to TMBT 2013 & many more years to come. Thanks for the memories TMBT 2012, & congratulations for a job well done! Not my finest moment but hey, still a group pic with da TOP runners!! Courtesy of Doc Sidhu's sharp eye! ps. Rest of my FB photos are here! pps. Thoughts on TMBT Results & Race Report are here! pps. Was nice to see familiar faces of KL runners again! Hopefully get to run with everyone again soon.